Plant onion sets in rows in any firm, well-drained soil in full sun. Prepare the planting area several weeks in advance by incorporating some well-rotted garden compost to improve drainage and soil fertility. Avoid planting onions on freshly manured soil. On particularly wet ground, try growing onion sets in raised beds. When growing onions from sets, plant the bulbs so that the tip of bulb is just protruding through the soil surface. Leave a space of 10cm (4”) between each bulb, and 30cm (12”) between each row. Onion sets are undemanding and require only occasional watering during particularly dry periods. However, rows should be weeded regularly. 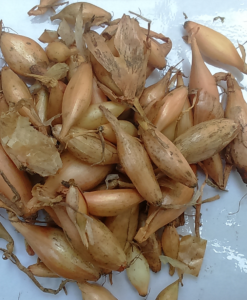 Harvest onions in late June and July, a week or two after the leaves begin to turn yellow.